I don’t really do that, I’m not that cruel. Reason I bring it up though is because the most famous sweet wine and food pairing is sweet wine and a strong blue cheese. That goes on the principle of putting together sweet and salty flavours that some people love. Especially when you have the dried fruit flavours of a noble rot sweet wine, you could pop in a bit of apricot chutney and, my life, you’re away! But obviously I’m not going to do that to my lovely wife. So what else? Well the wine is sweet, so I don’t really want to eat anything that’ll make it any sweeter and plug my mouth up. So I need to avoid anything too acidic. I can get away with very sweet food though, as it decreases the perception of the sweetness in the wine. That works for me. 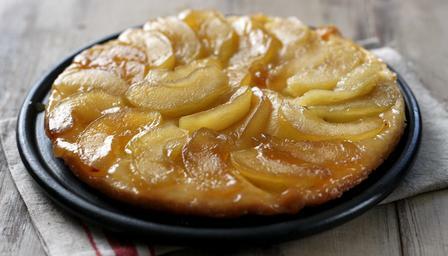 It’s got to be tarte tatin time! This has the added bonus of adding a bit of fruitiness in the food to match up nicely with the wine. I bloody love tarte tatin, finished off with a dollop of vanilla ice cream. Should be great. Have a top tasting yourselves.